This is usually a shrub of only a few metres high of the rainforest understorey. The specific epithet and the common name refers to the rusty hair on the underside of leaves (Nicholson and Nicholson 1994), which gives them a soft feel. Hairy Pittosporum grows a collection of white tubular flowers at the top of the plant. These then develop into slightly hairy yellow/orange fruits with a ball of red sticky seeds inside. 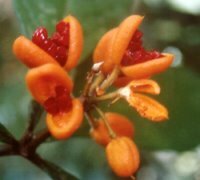 This plant is endemic to the Atherton Tablelands region.